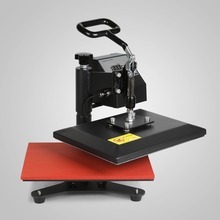 This multifunctional press include 5 accessories: flat heating plate ,mug heating plate, cap heating plate and plate heating plate (two size). 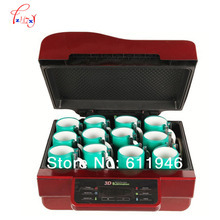 It enjoys multifunction in one machine, it can transfer words ,numbers and images on T-Shirts, garments, bags, mouse mats, jigsaw puzzles, cups, mugs, plates, baseball hats and any other items, suitable for producing gift, advertisement and so on. Easy to using. It is a manageable machine. Its unique swing-away feature allows you to rotate the upper heat platen 360 Fahrenheit degrees around. 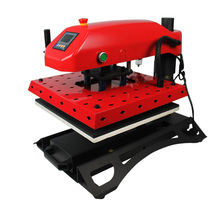 By moving the heating element aside and reducing the chance of accidentally contacting the area of heat distribution, you can work more freely with your garments and transfers on the base plate. 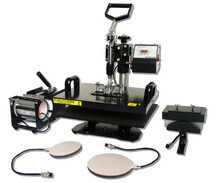 It has a built-in Teflon coated 38 x 29(cm) heat platen with a full range of heating coils to allow for consistency throughout its surface. The digital timer control is adjustable up to 999 seconds. The manual open and close handle is easy to operate and can be adjusted with the pressure knob at the rear of the machine. 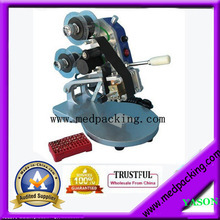 The machine is CE certified and come with 3 years free warranty. Versatile operation – Five separate heating elements allow transfers onto a variety of items, such as fabric, metal, ceramic, wood & glass. Create your own custom T-shirts, mouse pads, plates, coffee mugs, ball caps, tote-bags, license plates, and many other unique & fun items. Easy to use – Arrives fully assembled and ready to use (printer and paper not included). Swing-away design – This design is an improvement over clamshell designs, as pressure is directed straight down and is therefore more evenly applied; this improves the quality of the finished transfers. Full 360-degree rotation of swing arm; allows the heating element to be moved safely aside, reducing the chances of accidental contact. Digital LCD timer – Preset desired time and an audible alarm will sound when time is complete; helps avoid over exposure. 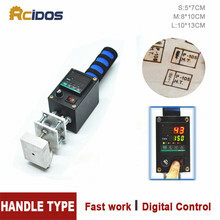 Digital LCD temperature control – Set the desired temperature and element will stop heating when preset temperature is reached. Full-range pressure-adjustment knob – Easy to access, top-mounted control. This allows the pressure to be adjusted according to the thickness of the material you’re transferring to. Coated handle – Comfortable rubber grip for everyday-use and long production runs. Teflon-coated element – Unlike other machines with bare-metal heating elements, all elements included with this machine, except for the cap press, are teflon coated. These surfaces are non-stick, prevent scorching of transfers, and don’t require separate silicone/teflon sheets. 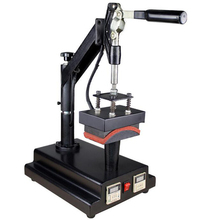 The cap press is machined from high-grade aluminum, and due to its size, shape and design, it does not require special sheets either. 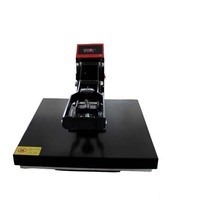 Removable lower platen – Lower platform is elevated with dual supports; these allow room for t-shirts to be easily placed into and removed from the machine, and the supports allow the platen to be easily swapped to convert the machine into a cap press. Rigid steel frame – Machine is heavy-duty, commercial-grade, super stable and built to last. Attention – The machine must have proper durable protective ground line. 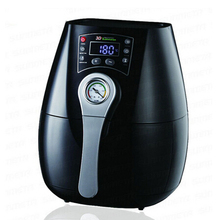 Please download the MANUAL HERE to see how to use this machine. 1. Delivery and handling cost include packaging, labour and storage costs. 2. We only ship to the Lower 48 States. We also don’t ship to FPO, APO or PO Boxes. 3. All US lower 48 state orders will be carried by either UPS or FedEx or USPS to residential or commercial address only, NO PO. BOX. Delivery. 4. All US lower 48 state orders are generally shipped out with 1- 2 business day after your payment has been cleared (Sat. & Sun. & Public holiday excluded ). 5. Delivery time will take approximately 3 to 6 working days for major city metropolitan areas and 5 to 8 working days for more remote areas. 6. Please supply correct telephone number ( preferably mobile phone ) for courier to contact when delivering large item. It is very important to make sure someone is always available to sign for the item; otherwise there will be a delay for re-delivery after an unsuccessful delivery. 7. We do not have pick up service. 1. 12 months Manufacturer’s Warranty for defective items (excluding items damaged and/or misused after receipt). Accessories come with a 3-month warranty. 2. Defective items MUST BE reported and returned to us within the warranty period (and in the original packaging, if possible). You must tell us what the defect is and give us your eBay ID. WE DO NOT REPAIR OR REPLACE ITEMS WITH AN EXPIRED WARRANTY. 3. You have 30 days to contact us and 35 days to return it from the date it was received. If this item is in your possession more than 7days, it is considered used and WE WILL NOT ISSUE YOU A REFUND OR REPLACEMENT. There are NO EXCEPTIONS! 4. 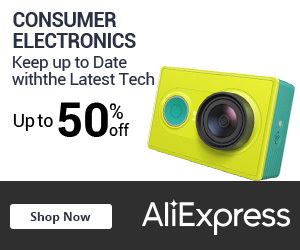 All returned items MUST BE in the original packaging and you MUST PROVIDE us with the shipping tracking number, specific reason for the return, and your eBay ID. 5. 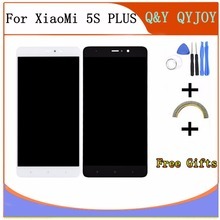 We will refund YOUR FULL WINNING BID AMOUNT, upon receipt of the item in its original condition and packaging with all components and accessories included, AFTER BOTH Buyer and Seller cancel the transaction from eBay. OR, you may choose to have a replacement. 6. Return shipping is to be paid by the Buyer. Dear buyers, we appreciate your business, if you are satisfied with our service, please leave us a positive feedback and 5 star DSR (Detailed Seller Ratings). After receiving the feedback and we will leave the same too for you, thank you. Please contact us befor you will leave a neutral or negative feedback, and give us the opportunity to resolve any problem. 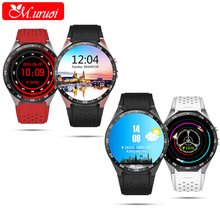 We understand the concerns and frustrations you might have, please do not hesitate to contact us first Via Ebay message and will be replied within 24 hours, and we will try to solve the problem for you. Communication is the only effective way to solve the problems.